Family Health is distributing VanishPoint Syringes that can reduce danger to drug users and non-drug users. 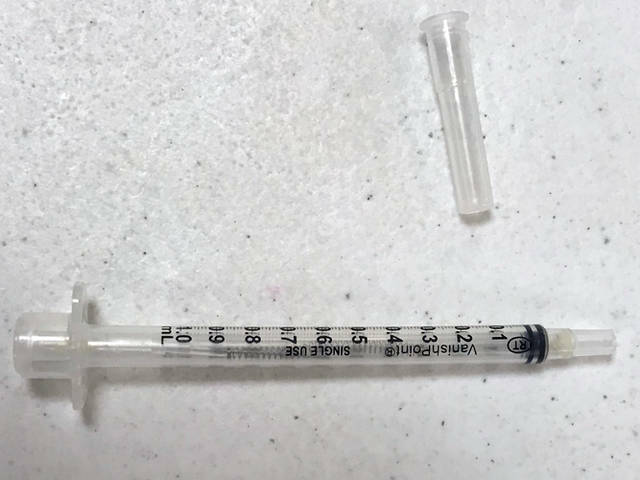 GREENVILLE – Needle exchange programs can reduce danger to drug users and other residents without costing taxpayers any money, officials from Family Health Services of Darke County said. Dr. Anna Hatic and Jean Young from Family Health spoke to more than 60 people at November’s Citizens for Safer Streets meeting at VFW Post 7262 in Greenville. They talked about Family Health’s needle exchange program and how it can reduce danger for drug users and non-drug users. “Not enabling but giving people an opportunity to get the help that they need,” Hatic said. Hatic and Young showed community members VanishPoint Syringes that Family Health has distributed to drug users in Darke County. Once used, the needle retracts into the syringe and cannot be used again – preventing the spread of disease to other drug users to unsuspecting individuals who may inadvertently be pricked by a discarded syringe. “Which is a safety measure for my kids playing on the playground,” said Hatic, a Greenville native who returned to the community in 2011 after working in Dayton. Needle sharing is one of the leading causes of outbreaks of diseases such as hepatitis and HIV as diseases can quickly spread between users. The needle exchange programs seek to curb the spread of disease by preventing the reuse of needles. Family Health received a $100,000 grant from Cardinal Health – the maximum amount it could receive – for its needle share program. The program started in October. “So far we’ve had very low participation,” Hatic said. It takes time to build trust between doctors and drug users, Hatic said, which is what Family Health is trying to do now. Family Health offers walk-in appointments, she said, as drug users tend to have problems keeping appointments. “Part of the hope is that people will feel like I can walk in and get what I need,” Hatic said. Along with the needle exchange program, Family Health offers resources such as Narcan, which can revive someone who is overdosing on drugs. It also has drugs such as Vivitrol, which can help prevent relapses into abuse by blocking receptors, available. The officials from Family Health stressed that grants fund the programs such as the needle exchange. “Not one penny of your tax dollars pays for this program,” Young said. Hala Knapke, the founder of Citizens for Safer Streets, said she originally thought the needle exchange program enabled drug use but after hearing from officials changed her mind about the program. “I’m proud of the fact that they’re doing what they can do, but we as citizens have to do what we can do,” she said. One area the Citizens for Safer Streets group is trying to make a difference is organizing neighborhood watch programs in Greenville. Greenville Safety Service Director Curt Garrison spoke at November’s meeting and told the attendees the city wants to support the community efforts. Residents were encouraged to contact the Greenville Police Department to share plans of their neighborhood watch programs. They also were encouraged to contact city council member with any concerns they have in their community. “If they don’t know what’s wrong or what concerns you, then that’s our fault,” Knapke said. Citizens for Safer Streets will host its next monthly meeting at 7 p.m. Dec. 19 at the VFW on Ohio Street in Greenville. By January or February Knapke hopes to have committees going that will lead community efforts create community awareness and involvement in an effort to clean up Greenville. This entry was tagged Citizens for Safer Streets, drugs, Family Health, Greenville, Needle exchange, Neighborhood watch. Bookmark the permalink.